Searching methodically for nearly half an hour, I was unwavering in my mission; literally no photograph would go unturned. Before kick-off – inside the programme hut at the Church Road stadium – a kindly lady had pointed me in the direction of a box of “older memorabilia” in which, I was unyielding in my quest to find evidence of one David Johnson. Whatever was going through my mind, one optimistic thought dominated; surely one image must exist of this unassuming and amiable player. 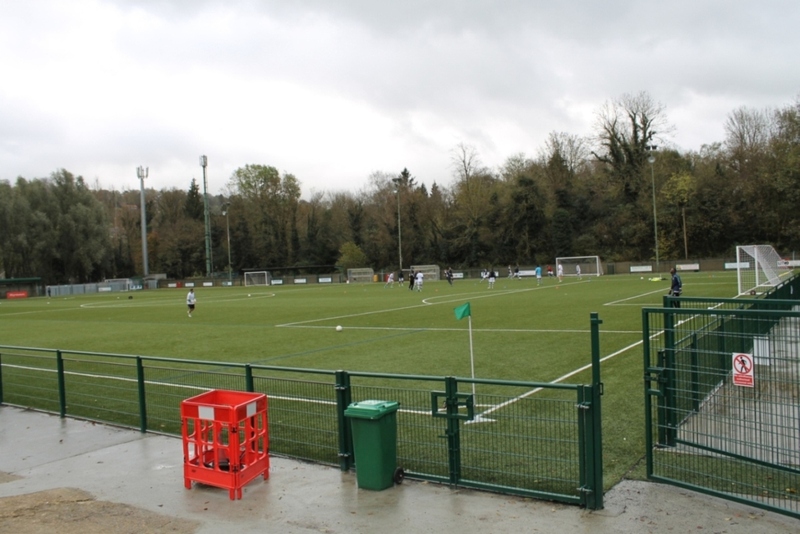 Since my last visit, the home of Whyteleafe had improved greatly. Said club shop still occupied a spot beside the turnstiles that were acquired from Stoke’s Victoria Ground and, the changing rooms and tea bar still overlooked the pitch; but brand spanking new perimeter fencing and a beautiful 3G pitch have become a massively welcome boost for this very deserving and friendly club. 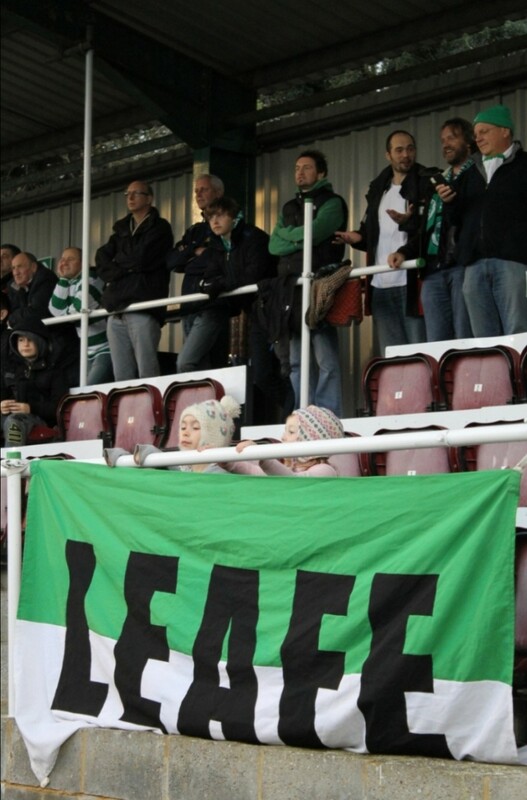 Filling a void in the local community, The Leafe were formed in 1946. 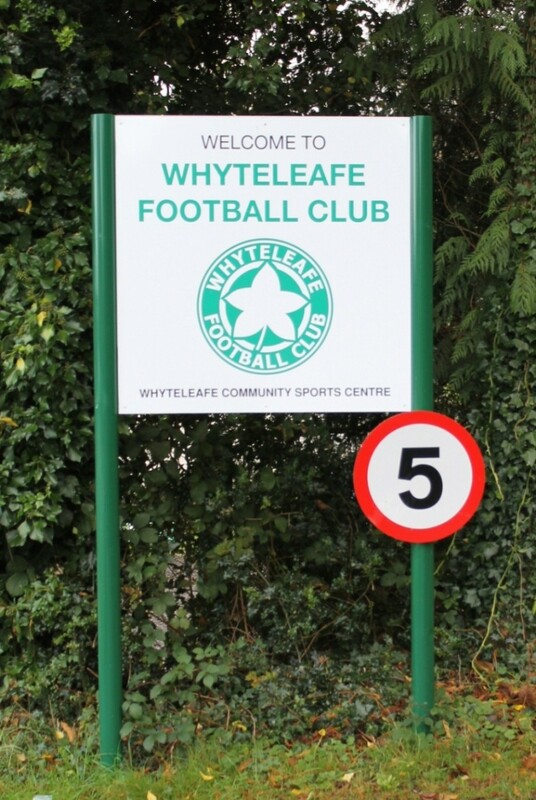 Initially competing in local junior leagues – following success in both league and cup – Whyteleafe bought four acres of farm land on nearby Church Road and stepped up to the Surrey Senior League in 1958. Their home ever since, this essential investment proved to be the foundation for even further progress. Whilst their record attendance of 2164 saw them hold Chester City 0-0 in the 1999 FA Cup, lifting the Southern Counties East League title last season promoted the club back into the Isthmian League. Parking up the aptly leafy Church Lane, I strolled into the officials’ car park. Straight ahead; young boys, resplendent in Leafe green, honed their skills on a 5-a-side pitch. Belying their outer appearance, to the left one finds a comfortable directors’ lounge and a busy and fantastic bar, whilst on the right, the main stadium where I knew a friend or two might be hanging out. Twenty years earlier, also at the behest of friends, local lad David Johnson had walked through the very same car park. Born in Gloucester, David moved to Croydon at the age of eight and had begun his playing career down the road, in Redhill. 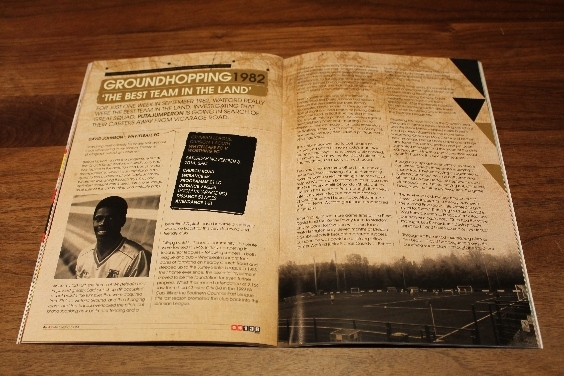 At the start of the 80s, a youth fixture pitched The Lobsters against Hertfordshire’s finest and – marking Charlie Palmer – Johnson made a fantastic impression on Watford’s then youth coach, Tom Walley. This one performance gifted David a privilege trial at Vicarage Road. Seemingly behind three others in the pecking order however, breaking into the Hornets’ first team became a real challenge. He may have helped Watford win both FA Youth Cup and The (last ever) Sheriff Of London Shield but, by the time he moved to Peterborough three years later, only seven league and cup first team appearances had been made. All Johnson’s nine first team Watford goals had been scored in friendlies. After finding much more game time at The Posh, David tried the Kenny Pavey route to stardom and headed for Sweden with then team mate Errington Kelly. Seven months at Division 2 Grebbestads IF brought moderate success but, soon he was back home joining fellow former Watford Junior, Francis Cassidy, at Bishops Stortford. There followed stints at Bourne Town, Kings Lynn, Dover, and Heybridge Swifts, before spending a season with Gerry Armstrong’s Worthing. Recounting these years, its unmistakable Johnson appreciates “great times” at all his clubs. Making friends and connections along the way, David evidently learnt much from each experience. After the Hornets however, his next silverware wouldn’t arrive until 1990, when he helped Dover Athletic lift the Southern League title. Discussing his move back to the Croydon area, the draw of familiar faces – including old school pals like Steve Mitton – helped make David’s mind up. Also influential in the move were welcoming Chairman Mark Coote and his then new manager. Former Leafe player and a huge fans’ favourite, Lee Richardson, had just been appointed manager and the mood at the club was buoyant. This was a post Richardson would go on to hold for the next eight seasons. Though no major achievements or silverware came from David’s three seasons playing at Church Road, before moving on again strong roots had been put down in both area and at the club (where today his nephew runs the clubhouse). He still loved playing but, ultimately David knew his future lay away from the game. there we stood – twenty years later – behind the goal David once scored in, watching the former clubs of both Messrs Johnson and Armstrong. Totally unaware of which players before us, if any, the very modest David Johnson might have helped it was nonetheless tiptoeing through my brain throughout the match. About us children played in the stand whilst, adults stood transfixed at a game that seemed better suited to cup football than a league encounter. The visitors started brightly. First Curtis Gayler’s free-kick thankfully sailed over Sheikh Ceesay’s crossbar then, Brannon O’Neill smacked a fierce drive through a crowded box and onto the post. The warning had been felt by the home side and – fortunately unscathed – counterattacks were launched whilst “LEAFE, LEAFE, LEAFE” chants emanated from those about us. 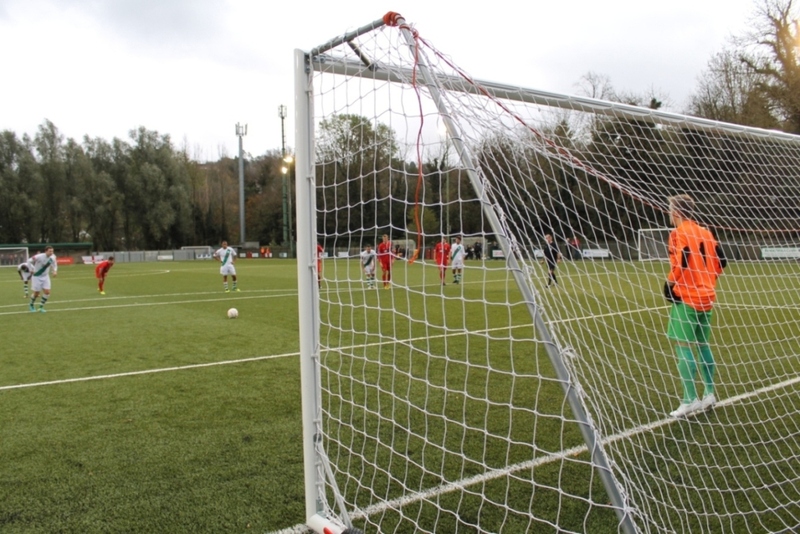 Roscoe Dsane swept through the opposition and forced a good save from visiting keeper, Jack Fagan, who was also wearing a Whyteleafe shirt due to kit clashes. Moments later Dsane crossed, Fagan parried Sam Clayton’s powerful header, and Tommy Smith struck the post from the rebound. With both team going close, deadlock was eventually broken ten minutes from time and, almost doubled in an action packed final floury. Dsane was clumsily bundled over in the box, Will Hendon was sent off and, Jason Thompson powered The Leafe ahead. Dsane cross was then deflected wide and a Smith bullet was superbly tipped to safety by Fagan. 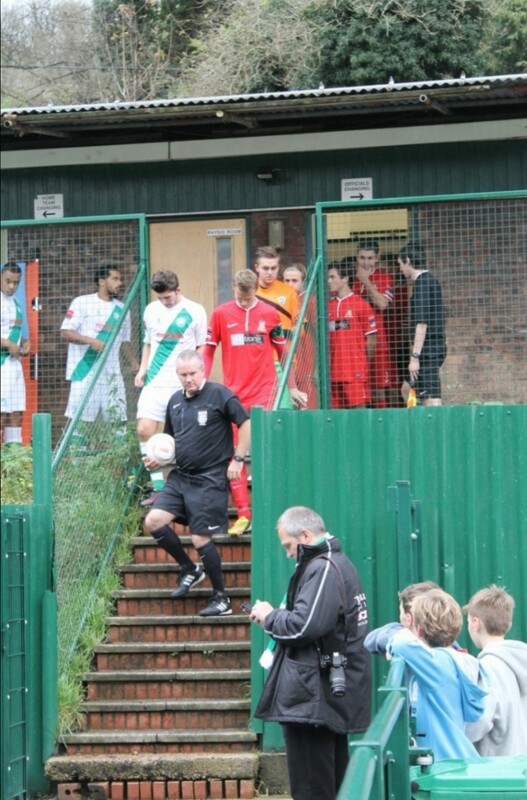 Thinking they’d have it easier in the second period, Whyteleafe sat back. The resulting equaliser was sadly predictable, even if it was a clearly yards offside. 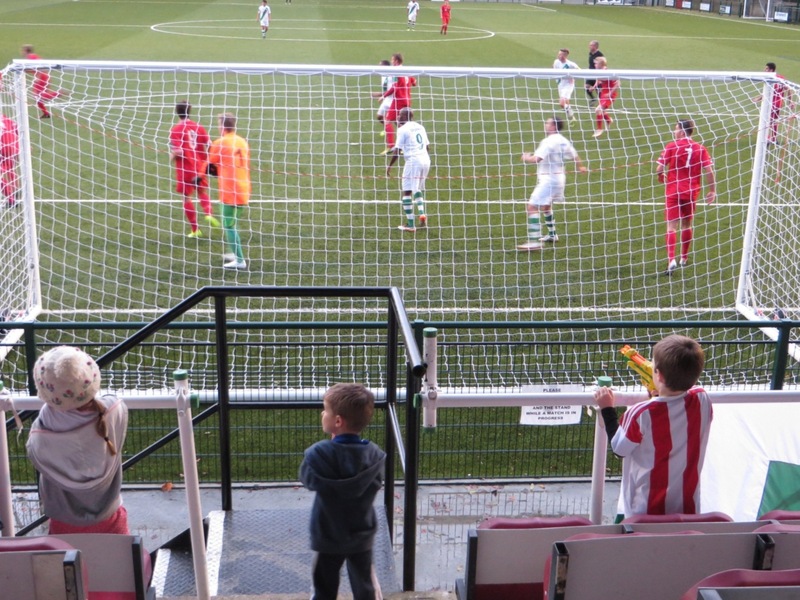 About us – having changed ends at half time – Worthing’s following, believing justice had been served, were finding their voices the more their side pushed forward. Bugiel fired Worthing level from close range on 90 minutes and O’Niell curled in a stunning free-kick from 25 yards just before the whistle had blown for the end of injury time. As celebrations peeled off towards the jubilant fans, standing helpless, Leafe keeper Ceesay hadn’t got near the shot. What happened was born purely from a healthy portion of fortune and sheer determination. Sometimes one wins, sometimes one loses. 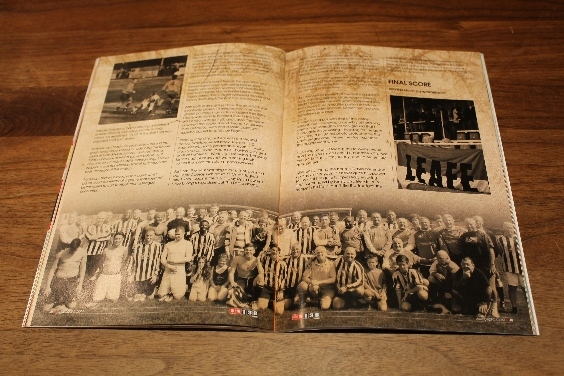 It wasn’t on a par with that of the visiting support but – following a superbly entertaining game in an incredibly friendly ground that I thoroughly enjoy visiting – heading for the gate clutching a single old photo protected by the day’s programme, I knew the day had been thoroughly worthwhile. Catching up with David in the following week, and finding so much I could empathise with, was the real bonus to this journey; one I’d never truly anticipated. This entry was posted in #WFC1982, 2014-2015, Isthmian League and tagged #WFC1982, Church Lane, Croydon, David Johnson, Division 1 South, Isthmian League, Leafe, Lee Richardson, Redhill FC, The Leafe, Watford FC, Whyteleafe FC, Worthing FC. Bookmark the permalink.